what's up with your Stevia seeds, any seedlings yet? Last night I saw one tiny seedling, which is a bit earlier than I expected (the seed bag says “Keimdauer: 10-20 Tage bei etwa 22°C”). 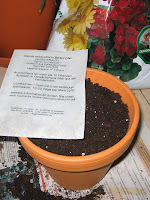 As I have never seen a stevia seedling before, it could easily be the seedling of some weed. However, the seedling looks a bit like a dandelion seedling, and since stavia and dandelion are related it just might be the first stevia plant to emerge. Time will tell. I created this blog in order to gather information about stevia. The reason there haven't been any updates for a long time is that I haven't found any information that adds substantial new information. I will add stuff if I find some, and I will consider linking to your site. Klaus, I discovered some interesting patents claiming that Stevia could be helping Osteoporosis - one example. You can read the details on my site. The Japanese hold international patents for many medicinal uses of Stevia rebaudiana..
On my site you can read how the Japanese hold international patents on Stevia Rebaudiana's medicinal properties against Osteoporosis. Sarah, you're right, you've compiled a wealth of information about stevia — I truly admire the work you've put into your site. I've added an announcement to my blog, and I send you my best wishes for your site.